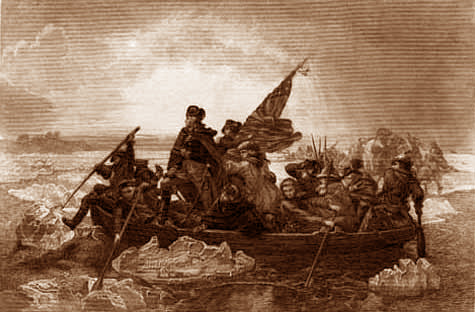 George Washington was not only adept at crossing rivers in the dead of winter, he was able to cross over from the other side and appear from the dead. The Civil War hung in the balance. A traitor had given General McClellan's plans for the defense of Washington D.C. to the South. His plans were being carried out without his knowledge, only by the Rebels . The nation's Capital could be lost and maybe the war. General McClellan had his faults and was eventually dismissed by Lincoln, but at this moment he had the spiritual receptiveness to be able to receive the Presence of George Washington who was vitally concerned for the future of this great country. Note the continuing theme as shown to Washington in his vision at Valley Forge. When 1862 dawned, few realized how dire the situation was for the Republic....General George Brinton McClellan went to Washington, D.C., to take over command of the United States Army. At 2 A.M. on the third night after his arrival, he was working over his maps and studying the reports of the scouts when a feeling of intense weariness caused him to lean his head on his folded arms on the table where he fell asleep. About ten minutes later the locked door was suddenly thrown open, someone strode right up to him and in a voice of power and authority said: "General McClellan, do you sleep at your post? Rouse you, or ere it can be prevented, the foe will be in Washington." In his published article General McClellan described his strange feelings.... He seemed suspended in infinite space and the voice came from a hollow distance all about him....The furnishings and walls of the room had vanished leaving only the table covered with maps before him. But he found himself gazing upon a living map of America including the entire area from the Mississippi River to the Atlantic Ocean. McClellan was aware of the being that stood beside him, but could only identify it as a vapor having the vague outline of a man. As he looked at the living map the general was at first amazed and then elated as he saw the troop movements and a complete pattern of the enemy's lines and distribution of forces. This knowledge would enable him to terminate the war speedily. But this elation dissolved as he saw the enemy occupy positions he had intended occupying within the next few days. He realized his plans were known to the enemy. At this realization the voice spoke again: "General McClellan, you have been betrayed! And had not God willed otherwise, ere the sun of tomorrow had set, the Confederate flag would have waved above the Capitol and your own grave. But note what you see. Your time is short." McClellan did note what he saw on the living map, transferring it to the paper map on his table. When this was done he became aware that the figure near him had increased in light and glory until it shone as the noonday sun. He raised his eyes and looked into the face of George Washington. "But her mission will not then be finished; for ere another century shall have gone by, the oppressors of the whole earth, hating and envying her exaltation, shall join themselves together and raise up their hands against her. But if she still be found worthy of her high calling they shall surely be discomfited, and then will be ended her third and last great struggle for existence. Thenceforth shall the Republic go on, increasing in power and goodness, until her borders shall end only in the remotest corners of the earth, and the whole earth shall beneath her shadowing wing become a Universal Republic. Let her in her prosperity, however, remember the Lord her God, let her trust be always in Him, and she shall never be confounded." Washington raised his hand over McClellan's head in blessing, a peal of thunder rumbled through space; the general awoke with a start. He was in his room with his maps spread out on the table before him, but as he looked at them [to his astonishment, he saw] the maps were covered with marks and figures he had made during the vision....this convinced him that his dream or vision was real and was from above. McClellan's action saved the capitol early in 1862, and saved the Republic from the second peril. The first "peril" had been the Revolutionary War. "Our beloved, glorious Washington shall again rest quietly, sweetly in his tomb, until perhaps the end of the Prophetic Century approaches that is to bring the Republic to a third and final struggle, when he may once more laying aside the crements of Mount Vernon, become a Messenger of Succor and Peace from the Great Ruler, who has all Nations of this Earth in His keeping. "But the future is too vast for our comprehension; we are children of the present. When peace shall have folded her bright wings and settled our land the strange, unearthly map marked while the Spirit eyes of Washington looked down, shall be preserved among American Archives as a precious reminder to the American nation what in their second great struggle for existence, they owe to God and the Glorified Spirit of Washington. Verily the works of God are above the understanding of man!"